Setting a example.. We win together.. That’s our motto. Thanks to Madison Margolin and The Times of Israel for highlighting 38 and our co-directors, Erez Safar and Badir McCleary’s efforts in the world.. progress! Here’s a snippet of the article, “It’s a chilly Sunday afternoon in early March, the final day of Scope, an annual three-day exhibit. Dozens of gallery representatives from around the world flew to New York for the weekend to showcase their art. Among them was Erez Safar, co-founder of Gallery 38 in Los Angeles. On the three walls in one of the many open-faced cubicles throughout the pavilion, Safar has installed colorful graffiti-style collage paintings by artist Raheem Saladeen Johnson, known professionally as King Saladeen, originally from West Philadelphia. 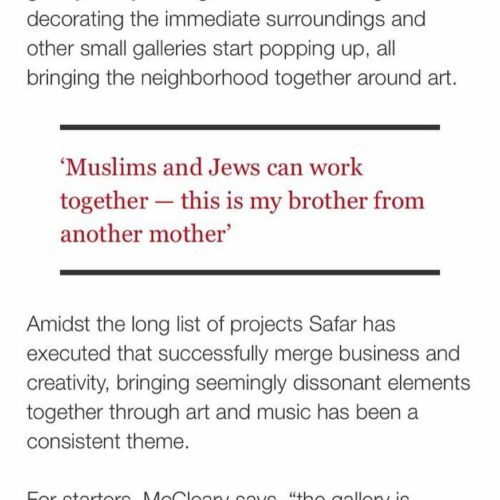 Saladeen grew up with Badir McCleary, who co-founded Gallery 38 with Safar in a gritty, muraled corner of LA’s West Adams neighborhood. King Saladeen’s art represents the meaning and feeling of living in the inner city, McCleary says, which is part of why it represents the gallery so well. “Because we’re part of the community in the inner city, in a developing neighborhood,” he says. On a boulevard dotted with hole-in-the-wall Mexican joints, auto shops, vintage clothing outlets, and organic cafes, Gallery 38 occupies a neighborhood in flux, one that weaves together various strands of LA’s ethnic life. Only since Safar and McCleary opened the gallery two years ago did muralists begin decorating the immediate surroundings and other small galleries start popping up, all bringing the neighborhood together around art. Amidst the long list of projects Safar has executed that successfully merge business and creativity, bringing seemingly dissonant elements together through art and music has been a consistent theme.